In the 1980, there were no such thing as fancy high-end video game action figures. 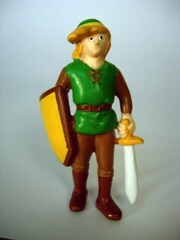 We got PVCs, small articulation-free figures of varying quality or the occasional wind-up toy. 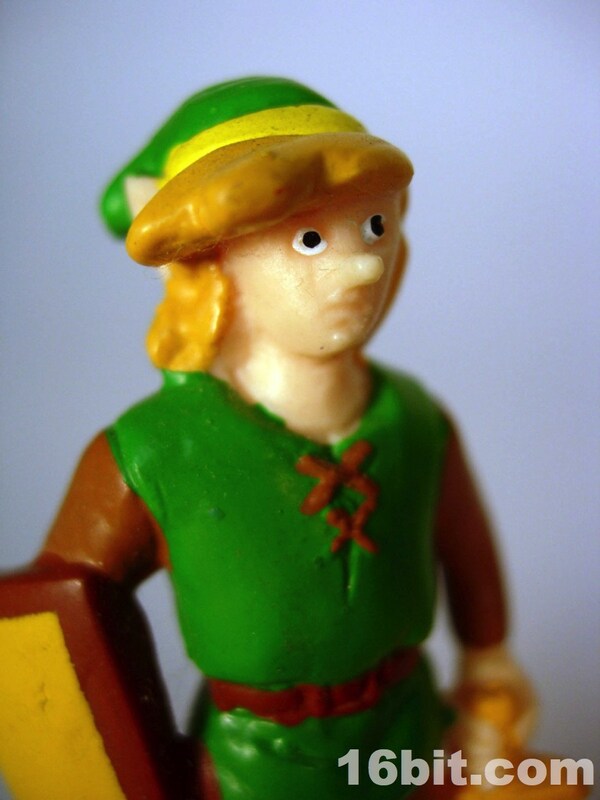 This Link PVC figure (marked 1989 NOA Applause Made in China, for searchiness) is a small plastic figure based on the character's artwork from the time of the second game in the series. 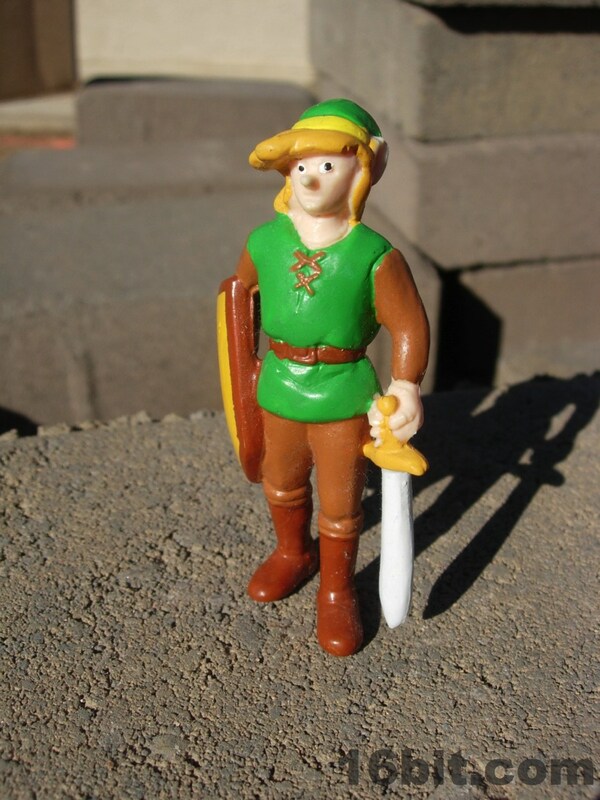 That's how you know I'm old-- I remember when there was only one game in the Zelda series, and how radical it was to see the change in design. Before he was a short, young, elf-like boy adventurer. 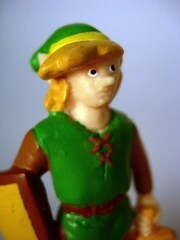 Later, he grew up, was taller, and was more like Jughead in appearance with a thinner build and a much longer nose. I don't believe there were any other Zelda PVCs, but I could be wrong-- this is the only one from this game (and from Applause) that I remember seeing. Sure, there were trophies and some other PVCs, but this one clearly looks like it was designed to match the art you'd see in the defunct Nintendo Fun Club News. 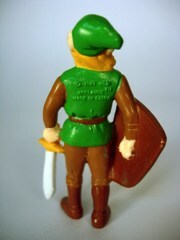 With a sword and shield, it has basically anything you could want out of such a figure. Except, you know, joints. Today you can get this Link on eBay fairly cheaply, but there were a lot of others since then. Toy Biz did one, Racing Champions/Ertl had their take, and it's amazing how expensive some of these are. To me, this means Nintendo and its licensees are dumb for not licensing a Smash Bros. figure line with all the chief mascots from their games, but hey, who knows. 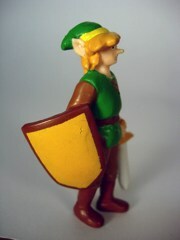 I like this one, and my guess is we'll never ever see another Link figure based specifically on Zelda II artwork. So get this one, and be secure in the knowledge that there probably won't be another one. 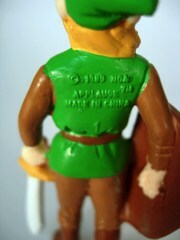 If there's one thing history shows, it's that American-sold Nintendo-based figures are damned expensive.